O Sankari! O Sankari! O Merciful (karuNA-kari)! O rAja rAjESvari! O Sundari! O parAtpari! O gauri! O Lotus (pankaja) petal (daLa) eyed (nEtri)! O Daughter (kumAri) of King (rAja) of Mountains (giri)! O Supremely (parama) Holy (pAvani)! O bhavAni! 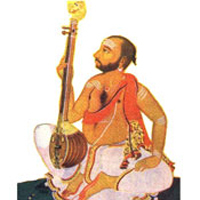 O Consort (kuTumbini) of sadA-Siva! O Sankari! O Sankari! O Merciful! O rAja rAjESvari! O Sundari! O parAtpari! O gauri! O Sister (sOdari) of vishNu – SyAma kRshNa! I (mAM) am Your child (SiSuM). Please look after (paripAlaya) me. O Sankari! O Mother (janani) of vinAyaka – elephant (kari) faced (mukha) and subrahmaNya (kumAra)! O kAtyAyani! O kalyANi! O Knower or Enlightener (bOdhini) of minds (citta) of all (sarva)! O Embodiment (rUpiNi) of elements (tattva) and knowledge (jnAna) (OR Embodiment of ultimate reality)! Please bestow (diSa) welfare (mangaLaM), victorious (jaya) happiness (mangaLaM) and auspicious (Subha) felicity (mangaLaM) for the entire (sarva) World (lOkAya).